Have you ever rolled up a hill in your car? At this location onThe A719, between Dunure and Croy Bay, this famous brae Attracts many visitors. 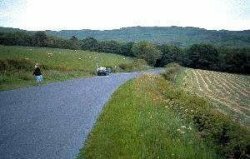 Care must be taken, but one can stop Your car on the Hill, leave the brakes off, and very slowly your car will roll up the hill.